A phosphorus-containing epoxy resin has been derived from a renewable resource, sebacic acid (SA), and formulated for flame-retardant applications. The synthesized epoxy resin was characterized by physicochemical and spectral analysis including Fourier-transform infrared (FTIR), 1H and 31P nuclear magnetic resonance spectroscopies. Curing of the epoxy resin mixture was carried out with polyamide hardener at 1:1 stoichiometry on equivalent weight basis. 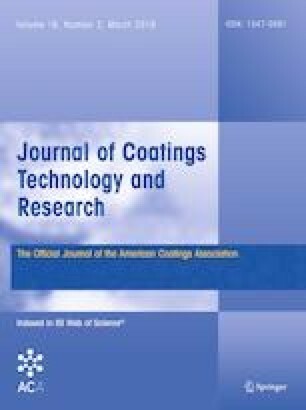 The developed coatings were characterized in terms of their mechanical, solvent, gel content, water absorption, chemical, thermal, and flame-retardant properties, while the glass-transition temperature and thermal stability of the coatings were analyzed by differential scanning calorimetry and thermogravimetric analysis, respectively. The results revealed that the coatings with added SA-based epoxy resin showed good mechanical, chemical, and solvent-resistance properties. The thermal profile of the coatings manifested that the char yield increased with the concentration of the SA-based epoxy resin. Limiting oxygen index (LOI) and UL-94 tests were performed to understand the flame-retardancy behavior of the synthesized coatings, revealing an enhancement as the concentration of phosphorus-containing epoxy resin was increased.